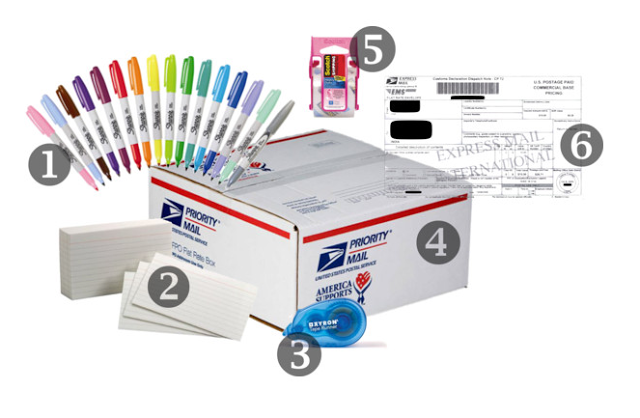 3 Steps to Great Care Packages - Easter is Near! Easter is a special time for everyone, and even if you can’t spend it with your loved one, there are ways to celebrate the holiday together while apart. A care package is the perfect way to show love and support to someone serving abroad, and Easter is a great occasion to make one. There are a variety of ways you can fill an Easter care package – there’s no right or wrong answer. Here are some fun and creative ways to get your loved one in the Easter spirit. 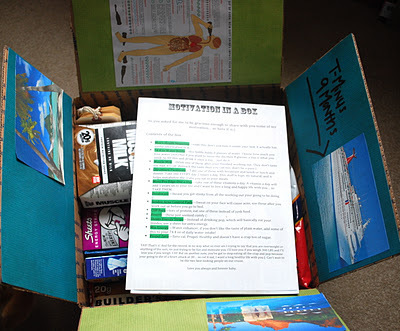 The first step when creating a care package is to go to your local post office and buy a flat-rate box. From here, let your artistic talents show! Paint the box or cover it with fun stickers. Include Easter grass inside to really get festive. An Easter card or a picture of the two of you is a great way to add a touch of personalization. Fill the box with Easter eggs - they even come in a camo print – and fill them with candy or little notes of encouragement. Pictures from past Easter celebrations or drawings from your children are sure to make him or her smile. 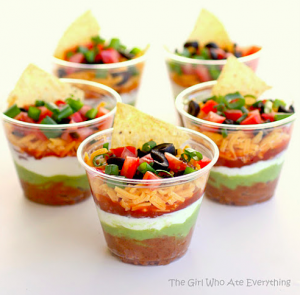 For food, personalization is key. You know best what your loved one craves or enjoys eating. Candy such as Peeps, Starburst's or jelly beans are great for celebrating Easter and can handle different weather conditions abroad. Sugar cookies shaped like Easter eggs are another easy and fun idea. Fixings for Easter dinner, such as instant potatoes or canned yams, will really make your loved one feel like they’re at home. This is a great place to get creative and festive. Add touches of fun and silly items to your package. Little toys and games like crossword puzzles or Silly Putty work great. An egg dying kit that only needs water will get your solider and the rest of his unit really in the holiday spirit. If they make friends with someone in the chow hall, you might be able to smuggle out some hard-boiled eggs to color. A “Happy Easter” banner or other similar decorations are perfect for hanging up around his or her room. Spending time apart, especially during a holiday, is never easy, but a themed care package is a great way to celebrate and keep traditions alive. Welcome to the military family. As the husband or wife of a service member, you are an active participant in the military lifestyle. You are also eligible for many benefits, including health care, shopping privileges on base, and access to base recreation facilities and other programs. You'll find it helpful to attend orientations and briefings for military spouses, and to read information that comes to you. Once you arrive at the military installation, visit the Community Service Center or Family Support Center as soon as possible to get up-to-date information on benefits and services as well as to enroll in a spouse orientation program. In the meantime, here is a quick checklist to get you started. 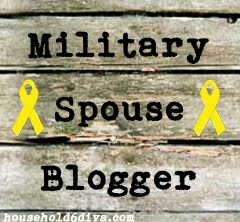 Your spouse, also known as your sponsor, is required to fill out all paperwork that will allow you to receive military benefits. Obtain an original copy of your marriage certificate from the city, town, or county clerk's office where the wedding took place. Ask your spouse to enroll you in the Defense Enrollment Eligibility Reporting System (DEERS). All service members and their dependents must be enrolled in DEERS to receive benefits. This system is what allows the military to verify that only authorized people are treated in its facilities. It is up to your spouse to enroll you. He or she can do that at the uniformed services personnel office. To find the office nearest you, go to http://www.dmdc.osd.mil/rsl. To enroll, you will need certain documentation, such as a copy of your marriage license and the birth certificates or Social Security cards of all dependents, including children. Obtain a military identification card from the ID card facility. 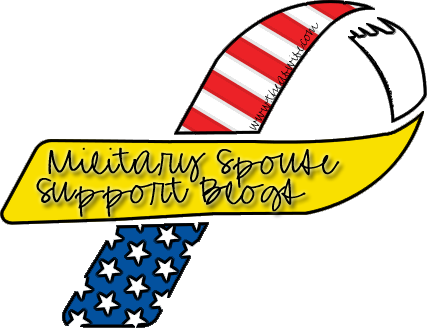 To receive benefits as a military spouse, you will need an identification card. All family members, including children ages 10 and older, will need their own ID cards. Your card will gain you admission to military bases, exchanges, and commissaries, and will allow you to receive medical care. Check with the ID card facility to confirm which documents you need to receive a card. Typically, you will need your marriage license, birth certificate, photo identification, and Department of Defense Form 1172 (application form) to apply for an ID card. Establish power of attorney. This will allow you to conduct business on your spouse's behalf. The base legal office will help you establish power of attorney. Register your vehicle on base. You can do this through the Provost Marshal or Military Police. Check with them to see what documents you'll need, but expect to bring your driver's license, Department of Motor Vehicles registration, and proof of car insurance. Tricare is the military's health benefits plan. Learn about the three options available at http://www.tricare.osd.mil. Tricare Prime. Similar to a health maintenance organization (HMO), patients sign on with a primary care manager and receive medical care from a list of authorized health care providers. This is the least expensive of the three plans and the only one requiring enrollment. Tricare Standard. Patients can see health care providers of their choosing. This is the most expensive of the three options. Tricare Extra. Patients may see any health care provider in the Tricare contractor network. In addition to Tricare, other health care benefits are available to service members and their families. The United Concordia Dental Plan is offered to dependents of Active Duty service members. Enrollment is automatic. Military hospitals. Also called Military Treatment Facilities (MTF), care is given on a priority basis as follows: Active Duty personnel; Active Duty family members enrolled in Tricare Prime; retirees, survivors and their family members enrolled in Tricare Prime; Active Duty family members not enrolled in Tricare Prime; and retirees, survivors and their family members not enrolled in Tricare Prime. Non-enrolled persons eligible for military health care may be seen at military hospitals and clinics on a space available basis. In addition to basic pay, your service member may be entitled to additional pay depending on the branch of service, deployments, duty locations, whether or not you live on base, and other factors. Ask your spouse to update his or her pay status. This can be done when your service member changes his or her records and enrolls you in DEERS. Familiarize yourself with your spouse's Leave and Earnings Statement (LES). The LES tells you how much pay, allowances, and leave (vacation) time your spouse has. Visit the Military Compensation Web site to learn about basic pay and additional compensation (http://www.dod.mil/militarypay). Learn how to read an LES at http://www.dfas.mil/money/milpay/les_djms.pdf. You'll need your service member's password to gain access to the LES online. Apply for government housing. Do this by putting your name on the waiting list at the housing office, or if you prefer to live off base, ask for a list of off-base housing. If you live on base, all your housing costs and utilities (except phone, Internet connection, etc.) will be provided, but you will not receive an additional housing allowance in your pay. A number of services are available on base to service members and their families. The commissary. Commissaries are grocery stores operated on military bases by the Defense Commissary Agency (DeCA). Unlike commercial grocery stores, which are operated to make a profit for their owners, commissaries are operated as a benefit to Active Duty service members, retirees, Guard and Reserve members, and their families. Commissaries sell groceries "at cost" plus a 5 percent surcharge that covers the construction of new commissaries and the modernization of existing stores. For more information, visithttp://www.commissaries.com. Child care. Military child care centers are tax-subsidized and therefore less expensive than private child care. Fees are based on income. Recreation. This falls under Morale, Well-Being, and Recreation (MWR), or Special Services and, depending on your installation, may include social clubs, fitness centers, bowling alleys, movie theaters, and more. There are also numerous support services available for service members and their families. You can learn what's available to you and your spouse by visiting your family support service Web site. This article was written with the help of Lorraine M. Neuser, Family Policy Analyst, HQ Air Combat Command Family Matters; and Mary Craig, Marine Corps Family Team Building Program Section Head. 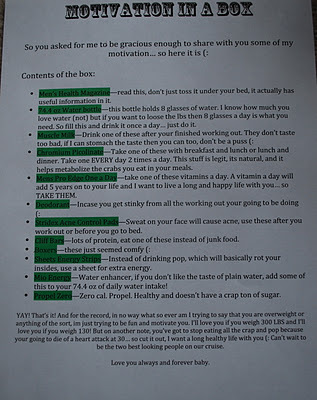 Here I share with you "Motivation in a Box." For any of you wives or family members who have run out of care package idea... feel free to use this as a fun idea, and something out of the norm. Also a lovely picture of the affects that drinking pop has on your body... its not pretty people, so cut out the pop. Chromium Picolinate-- an essential nutrient that helps metabolize carbohydrates and lipids. Plays a key role in weight loss and cardiovascular health. Deodorant-- the note says "Incase you get stinky from all the working out you'll be doing (:"
This box was created totally out of fun, and as a way to send something different than the typical toiletries. I hope this gives you all some motivation to get creative with your care packages! 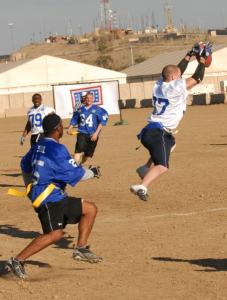 With football season rapidly approaching your personal service member may be pining for his normal Monday night fun. So what do you do when you’re asked to ship the Gridiron Express halfway across the world? 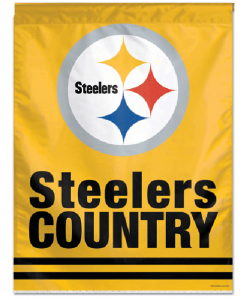 We’ve compiled seven easy football care package item ideas for the fan in your life. 1. Print out the stats! Not every place has the most reliable Internet access, so you can at least win the best care package award by making sure your box is rich on stats which, I’m told by the men in my life, seem to matter more to a fan’s existence than food and water combined. You can print out the entire NFL’s stats here, or just include those of your favorite team. Be it by poster or banner, team pride can be on high display hung by their rack or hooch. Make sure you send something inexpensive, though, in case your service person is in a transient unit and has to pick up and move, leaving the sports memorabilia behind. Even if he (or she!) can only wear it to sleep at night, a little team logo goes a long way. But for any downtime from the FROG suit, make sure he has that team tee or jersey to pop on. If hunting tag sales for a second-hand top that can be left behind doesn’t strike your fancy, Fanatics Outlet also has a wide selection and bottom-dollar prices (considering). You can’t ship chicken wings or surround sound, but you can at least get the job done with some of the basics of a football game at home… Nachos! It’s possible. A can of chili (Amy‘s is particularly good at this, but even Campbell’s will get the job done), a can of beans, a can of diced tomatoes, and a package of velveeta, and you’ve got yourself a much-appreciated nacho mix. And after discussing with other wives the shipability of chips, I maintain that you should throw in a bag of chips or pretzels. You may want to include a bowl – the cheap, dollar store disposable kind – and a spoon for stirring if you’re feeling full-service. Because there’s nothing in the world that can’t be made, shipped, and resemble it’s original product quite like a rice krispy treat, this post – and any care package – would not be complete without it. You can make these super cute football krispies with help from Family Ever After. 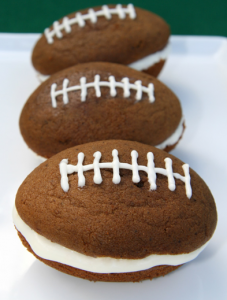 Make Me Merry features a great recipe for football whoopie pies, which you could make shippable by replacing the classic creme filling with some marshmallow fluff. I don’t know how you’d part with these once you made them, but you’re probably a better person than I. 5. Send a cup and a koozy! During football season, every water bottle deserves a little flair, ditto cups! They’re easy enough to ship and no one will cry when they don’t fit in the bag home. 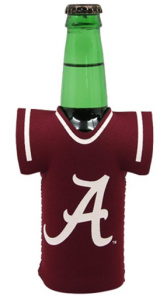 Although if the koozy comes with a picture of it wrapping itself snugly around a bottle of cold, delicious beer, it might be worth taking the tag off. I mean, if you’ve already eaten all the whoopie pies you meant to include, there’s no reason to add insult to injury. 7. And a real football! Most places already have them, so ask and see, but if there isn’t a football there to play with, make sure you send one along. “Every unit needs one,” or so says the care package recipient in this house. So try it out! Let us know how he or she likes it! I know mine would love it! A military deployment can be a trying time for a family. Having a mother, father, spouse or other family member away can be stressful for both the family and the soldier. A good sense of camaraderie among the unit while on deployment helps, but there's nothing like that care package from home to really get a soldier in the right frame of mind. Remembering what's important back home can go a long way toward helping families stay connected through extended absences. When putting together a care package, it's important to put some good thought into the contents. 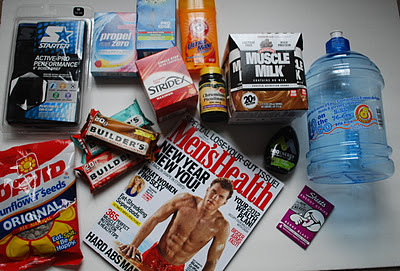 To help you out, here are 10 gift ideas you can include in your next military care package. Send your hero a little piece of home with a great care package. A great way to load up the soldier in your life with plenty of reminders from home is to send them a digital picture frame. These are a recent trend in the digital photography realm and a good idea if you want to send thoughts of home. The pictures are loaded onto a small built-in hard drive and play on a framed digital screen as a slide show. The good thing is, all that special someone in your life needs to do is open it and turn it on. You've already done all the legwork on your end, loading it with images that will be sure to get them through their long deployment. Digital photographs are a great way to send hundreds of photos at a time packed onto a tiny thumb drive. But if you really want to send a great reminder of home, make sure you take the time to root out some good photographic prints to include in your care package. Pick out some childhood photos of friends and family, or choose specific shots from memorable travels or important life moments. Make sure you package the photos in a plastic bag, and try to tuck them in another part of the care package, like a hardcover book. Pick the very best photos to make them special. One thing you might not think about when it comes to military deployment is the lack of availability of certain special food items. Sometimes soldiers are out in the battlefield for days or weeks at a time. Or they're confined to aircraft carriers or submarines for weeks and months on end. While the U.S. military does a fine job in supplying some special food options, they can't compete with mom's home baked cookies. Just pack enough for them to share with their comrades. Have the kids make something to send to mom or dad. In fact, every one of your care packages should include this. Not only does it help the deployed soldier, it gives the kids a way to connect with him or her. One of the challenges is keeping young children aware of and thinking of their mother or father (or any other family members). Tying in activities like this is a great way to maintain that awareness. And imagine the look on the face of the recipient -- even a simple crayon drawing can go a long way. Let their imagination run wild. Military clothing does its job, but it's not exactly built for maximum comfort. Including a favorite T-shirt or some other much-loved piece of clothing can be very special to someone away for long periods of time. There are times when the military can kick back and relax a little bit, and having your favorite old shirt on can be an excellent source of comfort. Make sure you pick something small, as they'll have to keep up with it for the remainder of the deployment. That huge Christmas sweater probably isn't a great idea. There's no specific polling on the topic, but it's a pretty well-known fact that a lot of military service men and women are also fans of their local sports teams. Sending some memorabilia from their favorite team can help them to feel connected to home. Think T-shirts, small pennants, magnets and hats. And if their team of choice has had success in recent years, then you can bet there's a DVD documenting that special season, which takes the sting out of missing the games. His favorite team can bring a smile to his face -- if it's doing well. If a picture says a thousand words, then what does 30 pictures per second say? That's the frame rate for home videos you can send your loved one overseas. And you don't even need a fancy video camera. New technologies let you use your phone to shoot and edit a short HD movie and send it via e-mail with a few taps on the touch screen. If you have them, include some old home movies in the care package. If they're on other formats like VHS or even film, there are transfer services that can bring you into the modern age. While a great deal of time abroad is spent keeping the United States safe, there's also some down time here and there. A great way to escape is settle in for some movie entertainment. Comedies are obviously a good choice, but send the movies they love best no matter what the genre. Make sure you find out what format is easiest for them to watch. Most laptops have a DVD player option, or sometimes there'll be access to DVD players. If digital files are best, load a few on a thumb drive and send that instead. Music is the backdrop to many special memories, and it can snap us back to a certain period of our lives in a mere second. Sending the gift of music in your military care package is an excellent way to boost the mood of your favorite soldier. In the spirit of a mixtape, you can compile song lists for different occasions, or just load up an entire MP3 player and send it on over. To finish off your military care package, add a special piece of your own clothing. Choose something that they love to see you in, whether it's your own favorite T-shirt or something to conjure up more romantic thoughts. Having your scent on that item is a great idea, too, so either wear it for true authenticity or spray it with any kind of body scent you may use. Smell is an overlooked sense when it comes to memories, so don't leave this out. Creative Ways to say "I love you" from a Distance. Saying “I love you” isn’t very difficult, but it can prove to be an issue when your spouse is deployed and communication isn’t easy. If you can’t talk on the phone every day, you might find it hard to communicate your love on a regular basis. So the next best thing is to get creative with the methods through which you say “I love you.” Here are several creative things you can do from the home front that serve that purpose. Get creative to communicate “I love you” to your deployed spouse. Love mugs- It’s a postcard, but better. Send your spouse a Postcup from Bailey Doesn’t Bark. That’s right, you write a message on the cup with a porcelain pen and send it to your spouse as a creative way of sending them love. Not only will they have a nice cup to drink out of, but they will also read your note on it every time they use it. Take on a project- Perhaps your spouse started a project at home that was not finished before deployment. Even though the project might not be your cup of tea, take it over and make it your goal to finish it by the next time they return. According to Base guide, ask your spouse’s friends for the best ways to do a certain project if you’re not sure. This act of selflessness will say “I love you” when your spouse comes home. Photo book- If you’d prefer to send something that doesn’t require words, a photo book is a creative way to visually say “I love you.” Include photos from all stages of your relationship to create a memory book that your spouse can look at to refresh those memories. Make a movie- According to Base guide, you can take the photo idea even further by sending your spouse a video compiling clips from you and your spouse’s other loved ones. Have family and friends record a short video expressing their support for your spouse and put the videos all together to make a live montage of the people important to your spouse. Get crafty- If you’re crafty, don’t be shy — your spouse will love a homemade craft from you and your children. Better Homes and Gardens lists thirty different crafts that say “I love you,” and will make perfect gifts to send to your spouse. Included are an I-love-you-notes jar, knitting kit, a pocket pillow and more. Poetry- Sometimes all that’s necessary is good old fashioned poetry. It’s more creative than an ordinary letter, and it shows you put a good deal of effort and thought into what you said. Your spouse will love receiving an original poem from you describing all the reasons why you love him or her. Treasure Box- Finally, a creative way to send your love is through a treasure box. This box should be filled with small things — little reminders from the past, present and future that hold significant meaning for both of you. Because your spouse won’t have much storage room, the smaller the better. But your spouse will be able to look at the mementos frequently and have a concrete way of staying connected to you while deployed. How To Tell Military Time! If your husband will be home at 5:00 p.m., it’s 17:00 (pronounced “17 hundred”). If it is 12:30 a.m., it’s 0:30 (pronounced “zero thirty”). Basically once you get to PM hours, all you are doing is adding the time to the number 12. If it is 2:00 p.m., 2 plus 12 is 14, making it 14:00 (“14 hundred”). You may often hear Army soldiers refer to their PT time as “zero dark thirty” as a joke! If you're interested in learning Military time, most smartphones allow you to change your clock to military time. I did this for a week and i learned in a jiffy! We get a lot of questions on the page about Graduation and Family Day. How do I get there? Can I jump on him? What do I wear? What will he wear? Can he stay with me? Trust us... we've been there. I recently found this post on an Army Facebook Page, and what better source can you ask for than from the Drill Sergeants themselves? PLEASE note that this was from an ARMY page, so the references in here do relate to the Army. However, most - if not all - of these tips can be translated to any branch. Enjoy! FAMILY AND GRADUATION DAY ETIQUETTE. If you are attending any graduation it is expected that you arrive well before the graduates march so you are seated and out of their way. The same is true at an Army graduation. Everything on an Army post runs on time so do arrive early. Get there at least 30 minutes prior to the ceremony. You will have to go through security checkpoints and obtain a pass from the Provost Marshall at the gate. Once you have completed that, you will have to find parking and a place to sit. There are no "no smoking" signs posted however, treat it as if there were. Because it is an outdoor ceremony, non-smokers have to be there too. Pretend that it is indoors and leave the cigarettes in the car. It is very distracting and uncomfortable to those who do not indulge and to the soldiers who have not been allowed tobacco for nine weeks. Crying children is inevitable and understandably, there is no place else to take them. Do what you can to prepare for the outbursts including bringing juices or water for them, snacks, toys, pacifiers, et cetera. The people attending graduation understand that children become bored or cranky but it is still very distracting when they want to see their soldier and hear the ceremony. Talking after you have been seated is perfectly fine. But as soon as the ceremony starts- be quiet. A whisper every now and then is fine but chatting for the sake of talking is plain rude. If you come in late, do not walk in front of the bleachers or ask people to move to accommodate you. Slip behind the bleachers to find your place and stay off the parade grounds as you will interrupt the soldiers. There are overflow bleachers to the left and right of the main bleachers, please sit there instead of interrupting the Ceremonies. There is no dress code for visitors to the post but a certain amount of common sense and respect should go into choosing your wardrobe. Consider that your soldier has been and will be under a dress code throughout his or her military career. It should not be hard to dress to impress for one day. Casual clothing is your best bet for an outdoor ceremony. Believe it or not, for women, a dress is far more comfortable than shorts or pants. Collared shirts and pants for men is a good choice for men. I know it is hot and you want to be comfortable but do take into consideration that it is a solemn ceremony. Again, take into consideration what you would wear to an indoor ceremony. Our soldiers will most assuredly be hotter than you as they will be wearing uniforms! Also wear comfortable shoes. Do not expect pavement wherever you walk on post. Remember this is a family oriented event. Clapping and standing ovations seem to be an odd mix of individuals starting and crowd mentality. Most of the time, the Army will request you to hold your applause until a signal is given. Sometimes the speaker will request a round of applause at certain times. Standing ovations should be reserved until someone in charge, usually the commander, has started it or requested it. When the soldiers march past the grandstands in the Pass and Review, you will be asked to remain in your seats until the last platoon clears your section and you are dismissed to find your soldier. When arriving on post for graduation ceremonies, there will be very clear directions laid out. Follow the signs and you will get to the parade grounds without a problem. When in doubt, ask. Wandering around a post is a surefire way to get lost. The quickest way to get yourself booted off a post is to disobey the directions of the military personnel. And for the sake of your soldier, listen and obey to those in charge. You may not be in the military but you are still on an Army post. Also, do be very careful driving on post. If you see a platoon out hiking by the side of the road, slow down and move as far over to the other side as you can. Your soldier is not allowed to start carrying around gifts or food items at the beret ceremony or the graduation. Save it for family time. Usually your soldier will be allowed out on pass following the beret ceremony and graduation. Take your soldier off post, which I am certain he or she will desire, and enjoy the gifts from home then. Your soldier will not be allowed to drink or use tobacco or get out of uniform once he leaves post so confine your activities accordingly. Army graduations are an amazingly stirring ceremony. You will feel so proud not only of your soldier but to be an American. Enjoy it and be sure to let your soldier know how proud you are of him or her. This is a great accomplishment and the graduation is just a small way of expressing their success. 1 & 2) Sharpies -- I have every Sharpie color ever made. I like to write notes on the note cards ("Only 6 more months!" "Love you, babe!" "Jack says, HI!") and stick them in between the objects in the box. My thinking is 1) it's cute and 2) he could keep them if he wanted to - or toss them if he doesn't! Also, the colors make it fun! 3) Tape Runner -- this is how I attach the paper to the inside of the box. Anything else just takes far too long. You can get 2 for $2.50 at Wal-Mart and it takes about 1 to cover the entire inside of a box. 4) Obviously, you need boxes. I ordered in bulk at the start of the deployment and have loved having the boxes handy whenever I needed them. You can get them on the USPS website FOR FREE, so I highly recommend ordering a bunch. 5) Tape -- other obvious item. I like my pink tape dispenser (not that it really matters). I do recommend heavy duty, but don't buy the kind at the post office -- you can get it much cheaper at Target or Wal-Mart. 6) Customs Forms -- It is infinitely easier (for me, anyway) to fill the forms out online and print the copies. This way, they're filled out, signed, and ready to go when I head to the post office. It cuts down on the wait time. And if you fill out the online version, you can fit five lines of items instead of four! How to Cope when Your Boyfriend/Husband Joins the Military. The military has always put stress on couples, and this trend seems to be even greater today. However, with the appropriate tools and planning, a relationship between a service member and civilian can be strengthened by these stresses and grow stronger through perseverance. Need to know how you will be communicating with your family while on duty? How expensive it will be on weekly basis? Find out when you are able to go for your break to visit your spouse at home? Connect before they leave. Often your significant other will receive forewarning before they must enter military service. Use this time wisely. Avoid the temptation to fight or criticize one another. Try to understand what your partner is going through. In some places, a military career is not one that is selected by choice. Do not dwell on the concept that you might lose one another. Instead enjoy the time you have together and grow closer as a couple. Work to connect on deeper emotional levels, and try to look forward to the future with optimism. Prepare for changes. When an individual enters military service they are often required to move away from their home, sometimes for several years. Be prepared for this. Work to establish plans. It may be worthwhile to create a plan and apply for jobs near where they will be stationed. Do not do this immediately though. Wait till they have reached their new base and are stabilized, otherwise the move could create undue stress for your service member while they are trying to integrate into a new unit. Talk it out and wait for their go-ahead. Prepare for changes in your partner. Nearly every Military in the world has some sort of Basic Combat Training. This is designed to take civilians and teach them how to survive in combat, while enforcing discipline and preparing them to be effective warriors. This initial training is generally designed to be difficult and it can be a life altering experience for many recruits. Be prepared for these changes. Do not blame your partner for them; these changes often symbolize adaptations they had to make in order to survive the rigors of training for combat. Prepare for changes in yourself. When your partner leaves you will have to find a sense of independence to keep going. Just as they are having to adapt to a new environment, you will be doing so as well. It is good to have a support network here, and it definitely helps if you set this up beforehand. Try to locate mutual friends and family members that know you both well. If it was just you and your partner, things can get very lonely if you have no one to talk to. Although you may feel the urge to stray away from your partner, strive not to do so. Leaving them while they are away may make them feel abandoned and betrayed. Communicate as much as possible. Many initial training programs limit communications with loved ones in order to simulate the rigors of war. Despite this, it is important to use whatever means possible to continue communication. Openly share your feelings and try not to hide anything. This can be a very stressful time, and if it seems like something is being held back it can compound that stress, creating unnecessary fights and heartbreak. If your partner is deployed to a combat zone, be prepared for sparse communication. If letters or phone calls are sparse, it does not necessarily mean that your partner no longer cares about you. It could just be that the logistical structure required to maintain that communication is lacking. Enjoy every minute of time you have together. Occasionally, your loved one may get blocks of leave where they can return home. Enjoy the time you have with them and use it to connect as a couple. Know though, that often they will want to see family and friends as well. Do not get upset about this, because odds are they have not seen their family for the same amount of time that they've been missing you. Do take time for yourselves though. Celebrate the strength you both have found by facing this tribulation. Continue planning for the future.